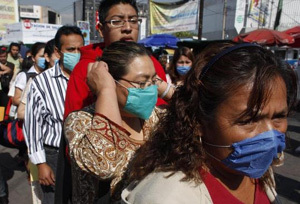 Residents of Mexico City take precautions against the Swine Flu. There is a lot more to the swine flu outbreak than a virus and a vaccine: There is, surprise surprise, a political-economic context. First of all, the press in Mexico has been reporting that swine flu may have originated in the factory farming of pigs by Smithfield Foods (the world's largest pork packer and hog producer). Smithfield has a major plant in Mexico -at Perote in the state of Vera Cruz, where the outbreak originated. The operations, grouped under a Smithfield subsidiary called Granjas Carrol, raise 950,000 hogs per year. The Vera Cruz-based paper La Marcha wrote this headline: "Granjas Carroll, causa de epidemia en La Gloria." The Mexico City daily La Jornada has also made the link -- saying that the Mexican health agency IMSS has acknowledged that the original carrier for the flu could be the "clouds of flies" that multiply in the Smithfield subsidiary's manure lagoons. There is also another political link. When the Stimulus Bill ("Recovery Act") came to the floor of Congress, it included appropriations of almost a billion dollars to prepare for a possible flu pandemic. But Karl Rove organized Republicans to demand that this money be taken out of the bill, and when Senator Susan M. Collins of Maine agreed to vote down a filibuster against the bill, one of her demands was that the pandemic appropriation be stripped out. It was. Somehow the notion that health is more than a private personal concern, that it involves the whole community and indeed the whole planet, has escaped the attention of some who call themselves "conservatives." There is a reason that we speak of people "hogging " everything for themselves, or eating "piggishly." It is about ignoring the needs of others and seeking to gobble up the world's abundance for the benefit of a few. That kind of greed is at the root of the impoverishment of the middle class, the bonuses of hundreds of millions of dollars for a small group of bankers, the willingness of Big Oil and Big Coal to burn the world for their own profit, and the willingness of the last US government to lie, torture, and kill for the sake of controlling great pools of oil. It is a remarkable irony that this kind of piggish politics may have helped create the swine flu epidemic --- no Amos or Jeremiah could have framed this burning joke more brilliantly than sheer reality has. But pork is not the only destructive version of factory farming. Almost a year ago, when the Postville debacle showed the destructiveness of present immigration policy, The Shalom Center also pointed out that the oppressive behavior of the Rubashkin owners toward both workers and animals was based on the effort to make super-profits out of factory farming. The torture of animals and the oppression of workers followed as a matter of course. So from many standpoints -- human health, climate healing, decent treatment of animals, and justice for workers --- we should be reducing meat consumption and restoring humane farming.